Student advocacy center has food, clothing and hygiene products for students, faculty and staff in need. Late-morning sun cast short shadows as faculty, staff and students stacked, hung and embellished collections of pasta, green beans and other non-perishables for the student advocacy center’s first Canbuster Challenge Nov. 15 in the mall. 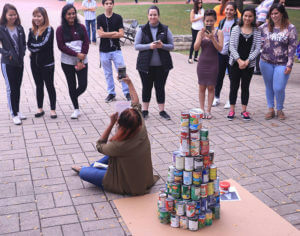 Departments and student clubs collected food and household necessities to compete in the sculpture contest and contribute to the center’s store. The drive collected about 3,000 items. The student advocacy center, located in Room 323 of Chance Academic Center, was started in November 2016. Among other services, the center offers students, faculty and staff access to a food store when they experience times of need. Since last November, the center has served more than 665 students. The store is affiliated with the San Antonio Food Bank, which provides support in stocking the store in addition to what local drives collect. Students, faculty and staff can pick up two bags of food twice per month. Black said drives at this time of year are important with the coming holidays, when food-insecure people struggle to have holiday meals. Crystal Valencia, early childhood studies sophomore and president of the early childhood studies’ ABCD Club, handed boxes of macaroni and cheese up to her brother, Christian Rodriguez, who stretched high to tape them as coconuts to vines of green yarn hanging in the young tree above him. 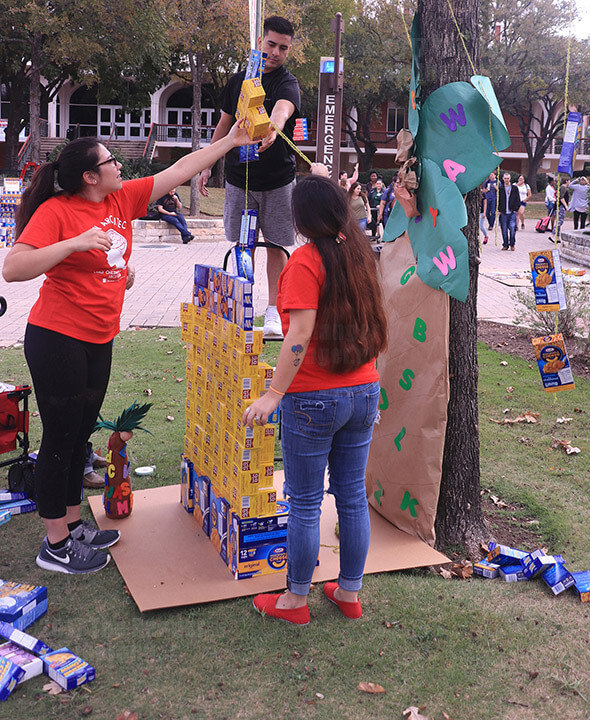 “We have to be really careful with the wind trying to blow down our macaroni,” said Diana Bobadilla, early childhood studies sophomore. The ABCD Club won first place for their sculpture based on the children’s book “Chicka Chicka Boom Boom” by Bill Martin Jr. and John Archambault. “Oh no!” Black exclaimed as the outreach and recruitment office’s vermicelli Thanksgiving pilgrim emoticon toppled in a gust of wind. “I told them I was going to kick it over, but I didn’t mean it,” laughed administrative assistant Pamela Frias. With the original sculptors nowhere in sight, Black and Frias tried to reassemble the felled fellow. “Boom! Done! You’re welcome!” Black shouted triumphantly as she stood back from a now-slightly-distorted-looking smiley, which she had supported with a chair. Back in its creators’ capable hands, the grateful noodle noggin was soon returned to its former glory. The center also offers a clothing closet, book voucher program and case management assistance. To learn more about the center’s food store and other resources, visit www.alamo.edu/sac/advocacy or email Black at sac-socw@alamo.edu. great, resourceful news article. Great job and having a video included really showed the effort the writer did to make sure there was a visual as well. Thank you.